Interstate 189 and the unopened Southern Connector between U.S. 7 (Shelburne Road) and Home Avenue in South Burlington. Interstate 189 is the lone branch route for I-89. The freeway spur connects U.S. 7 (Shelburne Road) with Interstate 89, Dorsett Street and Kennedy Drive north to Burlington International Airport (BTV). Interstate 189 opened to traffic from I-89 west to U.S. 7 on November 29, 1962. The freeway was originally planned to connect with the Burlington Belt Line Highway as part of the 1965 Greater Burlington Urban Area Highway Plan. Serving industrial areas and Downtown Burlington, the Belt Line was proposed south from Burlington to U.S. 7 and north along the Lake Champlain waterfront. Northern reaches of the expressway extended along Winooksi Valley Parkway (Vermont 127) toward the Colchester town line. Despite right of way acquisition already made, plans for the expressway succumbed to adamant neighborhood opposition and a resurgence in the city economy. They were subsequently cancelled. 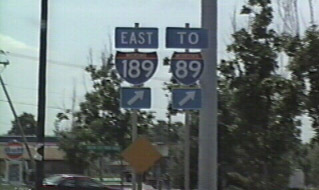 Previous signage for I-189 on U.S. 7 (Shelburne Street) south out of Burlington in July 1995. Interstate 189 concludes eastbound at a modified trumpet interchange with I-89 in three quarters of a mile. Photo taken 07/22/05. I-189 separates in three ramps at the exchange with Interstate 89. The southbound off-ramp leads to the suburb of Williston, located to the east along U.S. 2, and the capital city of Montpelier, situated 37 miles to the east along the Winooski River. Photo taken 07/22/05. Continuing eastward along I-189 to the left exit for Interstate 89 north to the city of Winooski, St. Albans and Montreal, Quebec via Autoroute 35. Kennedy Drive extends east from the freeway end at Dorsett Street to Burlington International Airport (BTV). Dorsett Street parallels I-89 north to University Mall and U.S. 2 (Williston Road) in South Burlington. Photo taken 07/22/05. Interstate 89 travels westward across the Williston and the city of South Burlington to the exchange (Exit 13) with I-189. The four lane freeway passes under Vermont 116 (Hinesburg Road) one mile east of Exit 13. Photo taken 07/22/05. Interstate 89 makes a gradual northern turn toward the city of Burlington to I-189 at Exit 13. Interstate 189 provides a direct connection to U.S. 7 south to Middlebury and Vergennes. Photo taken 07/22/05. Exit 13 loops onto I-189 west from Kennedy Drive. I-189 west to U.S. 7 (Shelburne Street) leads motorists norto to the Burlington CBD. Champlain Parkway will provide a more direct route to Downtown when it is completed. Photo taken 07/22/05. I-89 advances south from a cloverleaf interchange (Exit 14) with U.S. 2 (Main Street) to Interstate 189 west at Exit 13. I-189 west to U.S. 7 leads to the suburb of Shelburne, Middlebury and Rutland. Photo taken 07/22/05. Exit 13 leaves Interstate 89 south for I-189 west at South Burlington. U.S. 7 travels 19 miles south to Vermont 22A outside the city of Vergennes. Vermont 22A provides the first leg of a route to Upstate New York via the Lake Champlain Bridge at Crown Point. Photo taken 07/22/05. Dorsett Street southbound intersects Kennedy Drive at the westbound beginning of Interstate 189 in South Burlington. Photo taken 07/00. A wide median separates the roadways of Interstate 189 leading away from I-89 and Kennedy Drive. There are no exits westbound ahead of the ramp to U.S. 7 (Shelbourne Street). Photo taken 07/22/05. Interstate 189 converges with U.S. 7 at a parclo interchange in 0.75 miles. U.S. 7 joins the Burlington area with Vergennes, where Vermont 22A branches southwest toward the Lake Champlain Bridge, and Rutland, Vermont’s second largest city. Photo taken 07/22/05. All traffic shifts from the freeway mainline onto the off-ramp for U.S. 7 (Shelburne Street). Three of the six ramps at the exchange are closed, as they were built for the unopened Southern Connector. Photo taken 07/22/05. U.S. 7 constitutes a four lane commercial boulevard arterial south from Burlington to the town of Shelbourne. Photo taken 07/22/05. U.S. 7 (Shelburne Street) passes between a pair of retail plazas from Home Avenue to the parclo interchange with Interstate 189 east. Photo taken 07/22/05. An unopened on-ramp separates from U.S. 7 south ahead of the I-189 underpass. This ramp and other unopened connections will link with the future Champlain Parkway from the South End neighborhood. Photo taken 07/22/05. 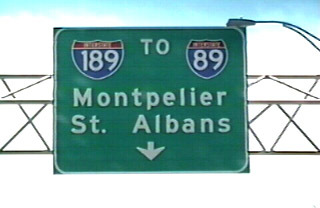 A loop ramp lowers from U.S. 7 south to Interstate 189 east for I-89 to Montpelier and St. Albans and Kennedy Drive east to Burlington International Airport (BTV). Photo taken 07/22/05. The second in a series of overheads for the upcoming exchange with Interstate 189 east on the Burlington city line along U.S. 7 (Shelburne Road) northbound. Photo taken 07/22/05. Two lanes depart from U.S. 7 north for Interstate 189 east to I-89 and Kennedy Drive in South Burlington. Photo taken 07/22/05. Champlain Parkway – Project History. City of Burlington, project web site. “Champlain Parkway construction could begin this year.” WCAX (Burlington, VT), January 5, 2019.